A factory in the Cavite EPZA, the country’s biggest export zone, which supplies parts for big US electronics companies is on the verge of another strike as workers voted to authorize a work stoppage. A majority of the union members at the Korean-owned Seung Yeun Technology Industries Corp. (SYTIC) voted yes in the strike ballot yesterday. 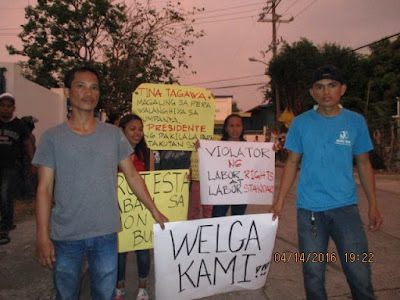 Just after participating in the Labor Day commemoration held by the militant Partido Manggagawa (PM) in the town of Rosario, a stone’s throw away from the Cavite EPZA, SYTIC workers authorized the holding of a strike in response to union busting and illegal closure by management. An earlier five-day strike in April by SYTIC workers ended in a victory with 18 workers, who were illegally terminated for union activities, reinstated back to work. However, the company later filed for permanent closure which the union is contesting is a union busting scheme. “In the conciliation meeting called by the Department of Labor and Employment last Thursday, it was manifested by management that SYTIC has orders from its multinational electronics customers for the next several months and thus there is no valid reason to shutdown. It is as clear as the summer sun that closure is a maneuver to break the newly-formed union. We won the first round of the fight. We will win the second as well,” averred Frederick Bayot, president of the SYTIC Workers Association. “Management is offering a separation package and then rehiring of the present workforce as contractuals for the succeeding months of operation. SYTIC workers are now dealing with the complex crime of union busting and labor contractualization,” Bayot eleborated. Cavite EPZA workers who participated in the Labor Day activity pledged support for the “round two” of the fight of SYTIC workers. “Ang laban ng SYTIC workers ay laban ng lahat ng EPZA workers,” insisted Magtubo. The former union president of Fortune Tobacco Corp. committed to mobilize solidarity from the labor movement in the country and abroad. I like the article on this page, simple and easy to understand. Insurance is the most widely sought after in order to avoid undesirable things such as cheap travel insurance, cheap car insurance and various other insurance required.